In 1962 I was in my last year at the Perse school, Cambridge, trying inadequately to get into university to study classics, when Eddie O'Hara came to teach there, his first job. His Liverpudlian accent and his love of rock’n’roll were exciting and exotic, but more important for me was his ability to help us change our attitudes to learning and to surprise us by respecting us. He made the difference. I still quote his immaculate (and rhyming) Latin translations of lines from hit songs of the day such as “Only ever has to give me/Love forever and forever” – Nil habet quod mihi det quam/Caritatem sempiternam – from She’s a Woman by the Beatles. 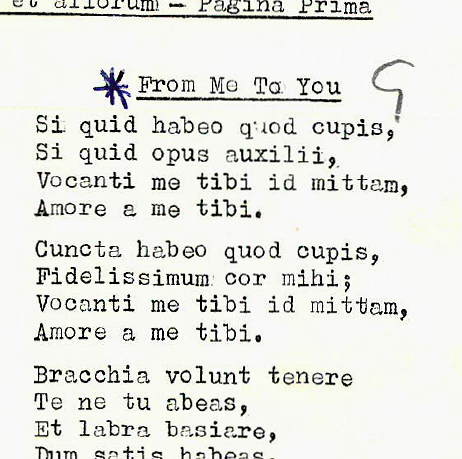 Eddie O'Hara's son, Terry, recently came across three foolscap sheets among his late father's personal effects, containing the 17 song lyrics Eddie translated into Latin to inspire his classics students, including Pete, at The Perse School, Cambridge over 50 years ago. Among them are 13 titles recorded by The Beatles, including 10 Lennon-McCartney compositions. These translations are remarkable for the way they've preserved the spirit of the Beatles' (and others') songs, while scanning and rhyming perfectly in accurate Latin. Terry has kindly given us permission to publish them on Pete's website, so... here they are: Carmina Popularia, Blattarum et aliorum, by Caligula. As well as my transcriptions of the lyrics on the page, I have provided a high resolution copy of the originals, which can be downloaded as a PDF file. I was on the point of completing the page layout, when I came across a YouTube video by author Keith Massey, which includes the song Amore A Me Tibi (With Love From Me To You), in Eddie's Latin version. I've included this in our page.